We at PerfectSmoothie.com know how hard it is to find the time to eat well. Eating smaller nutritionally balanced snack-sized meals has been shown to be healthier than eating fewer large meals or skipping meals entirely. Our number one choice for the most healthy snack is our beloved smoothie. Smoothies are an amazingly simple way to consume a synergistic and varied blend of superfoods, vitamins, and phyto-nutrients all in one snack. By using frozen ingredients and a high-end blender you can make a smoothie from start to clean-up in under 10 minutes. By creating your own custom recipes you can get the exact macro-nutrient profile and calorie content your body needs, making this the perfect healthy snack. There are an infinite number of recipe combinations, and you can literally try something new every day. Larabar Fruit and Nut bars are an amazingly simple and nutritionally complete snack that contain a balance of healthy fats with low-glycemic fruits. They are an unbelievably delicious and healthy snack you can eat every day. They are gluten-free, 100% natural, certified kosher, non-GMO, vegan, and have no added sugar or salt. 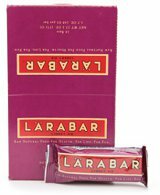 Where to Buy: The cheapest way to buy Larabar's products are with free shipping from amazon on orders of $25 or more. This is less per bar than either Walmart or Target! Kind Fruit & Nut bars are another very popular fruit and nut bar. They also use all-natural ingredients and are gluten-free, low glycemic, non-GMO, have low sodium, and are a great source of fiber. The Yale-Griffin Prevention Research Center did a study showing that eating 2 KIND bars a day will help maintain weight due to the low glycemic index of the fruits. These bars are nutritionally rich and taste delicious. 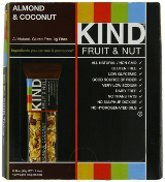 Where to Buy: KIND fruit and nut bars can also be purchased with free shipping from amazon on orders of $25 or more, which is the cheapest price we have seen. Alive & Radiant's Kale Chips are a nutritionally dense and low calorie super-food with lots of Vitamin K, A, and C. Kale has been shown to be beneficial for eyesite, weight management, and heart health. Alive & Radiant's kale chips are a raw food, certified organic, gluten-free, vegan, and are combined with organic cashews for a healthy source of fat. At only 220 calories per bag, many people say that after you've tried these chips you will never go back! Where to Buy: The full nutritional information can be see here. However, Alive & Radiant's most popular selling kale chips "Quite Cheezy Kale Krunch", can be purchased in bulk with free shipping at a 25 percent discount over the individually packaged bags. Annie Chun's Seaweed Sesame Snacks are a 100% natural savory roasted Korean seaweed with healthy sesame oil and added sea salt. They are a great low carbohydrate healthful snack with lots of Vitamin C and B12. Because seaweed is a great source of vegetable protein these make an excellent nutritionally balanced snack. Seaweed helps improve blood sugar regulation, digestion, and has been clinically shown to have anti-cancer and anti-inflammatory effects. Where to Buy: Annie Chun's Seaweed Sessame Snacks can be purchased with free shipping from amazon. Navitas Naturals Goji Berries are 100% certified organic, gluten-free, non-GMO and contain over 20 important minerals and vitamins including zinc, iron, B2, and Vitamin E, A, and C, as well as healthy cartenoids such as beta-carotene. Goji berries are packed with protein and esstential amino acids making them great nutritionally balanced healthy snacks. Goji berries can be eaten by the handful or added to a cup of oatmeal, trail mix, or even a smoothie. 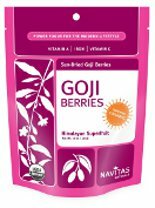 Where to Buy: Navitas Naturals Goji Berries can be purchased with free shipping from amazon on orders of $25 or more. Have any favorite healthy snack ideas that we didn't mention? Please let us know!